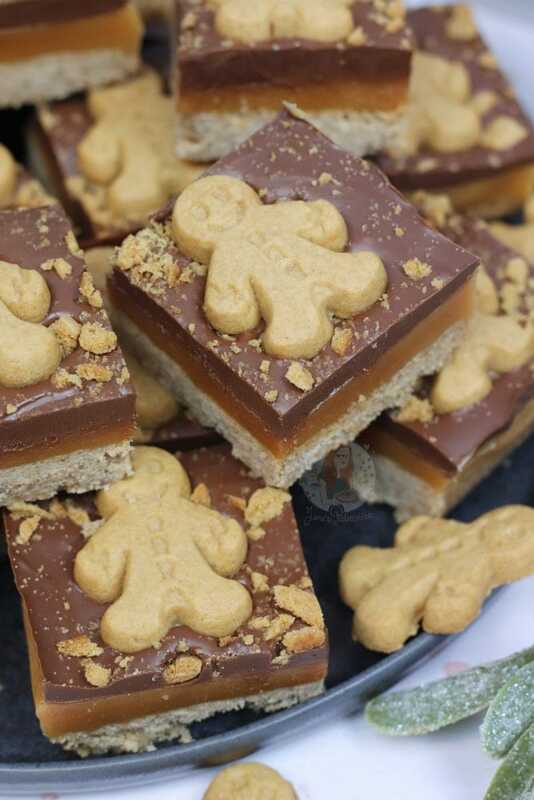 A Homemade Gingerbread Shortbread, topped with Homemade Caramel, Ginger Chocolate and Gingerbread Men! 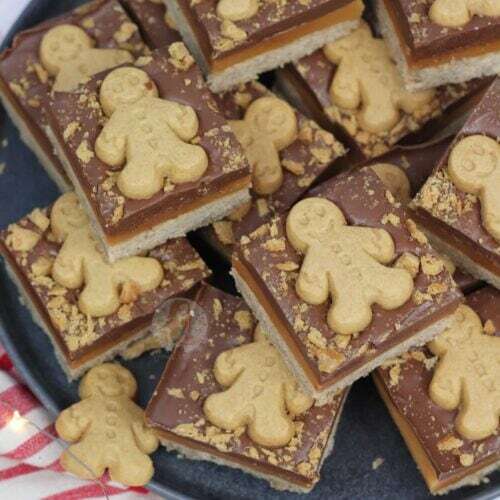 Perfect Gingerbread Millionaires Shortbread! So, I do think the theme of the year is Gingerbread, and that was entirely accidental. Honestly, I don’t know how it happened, but I’ve just gone a little Gingerbread Crazy! I can’t actually keep up with my love for Gingerbread this year, but it is happening still. My Gingerbread Drip Cake, my Gingerbread Cheesecake and now this beauty of a Traybake is here. 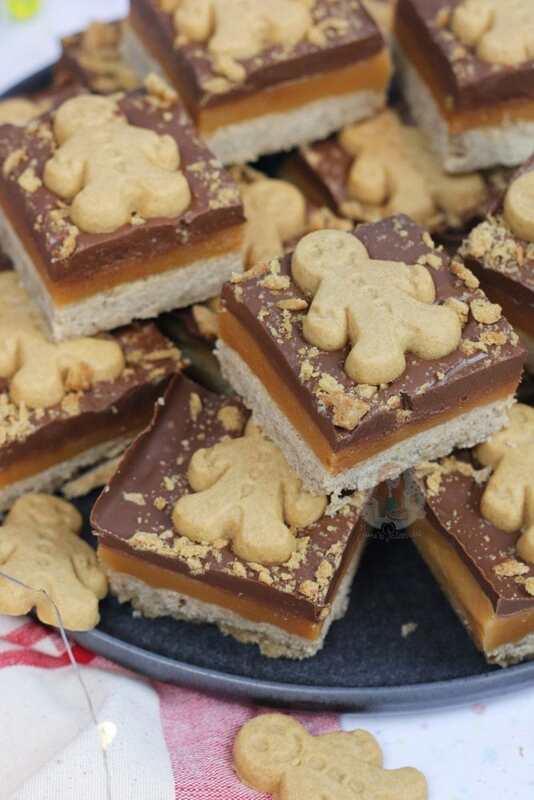 Oh, how I have wished for a traybake like this for oh so long… My Biscoff Millionaires Traybake was the main inspiration, as that is already quite spicy, from the Lotus Biscuit flavour, but this is on a whole new level. Using the ground Spices of Ginger, Cinnamon, Nutmeg and All Spice inside the shortbread brings it to an entirely new level. It’s INCREDIBLE. The rest of the spices are optional, but the Ground Ginger is obviously the most important. To be honest, though, most gingerbread biscuits are made up of more than one spice. 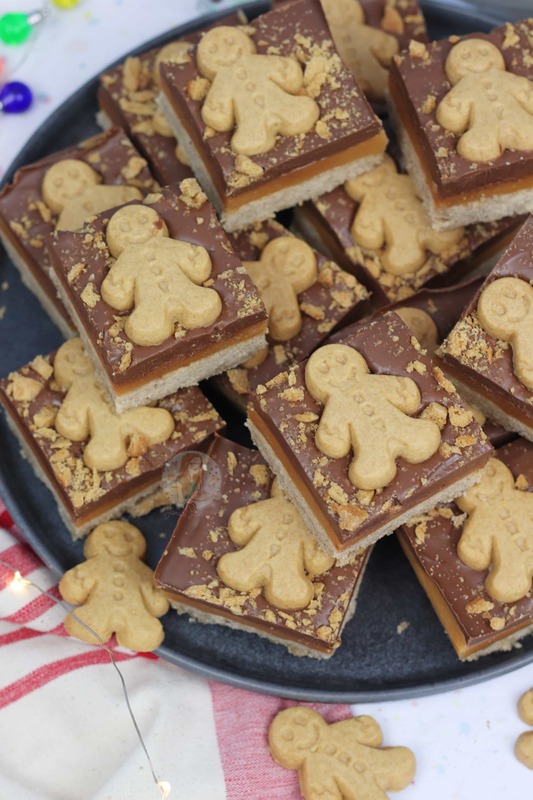 My Gingerbread Biscuit recipe is one of those exact recipes, even my Gingerbread Cheesecake! I just adore the different flavours, and it makes it such a warming treat, especially during Winter! Gingerbread is for life of course, not just for Christmas, but it’s definitely more of a festive thing. Gingerbread Hot Chocolates when you go out, all the gingerbread biscuits that are on offer to buy… so much gingerbread. Gingerbread isn’t even really looking like a word any more as I have typed it so many times, and I still have so long to go. 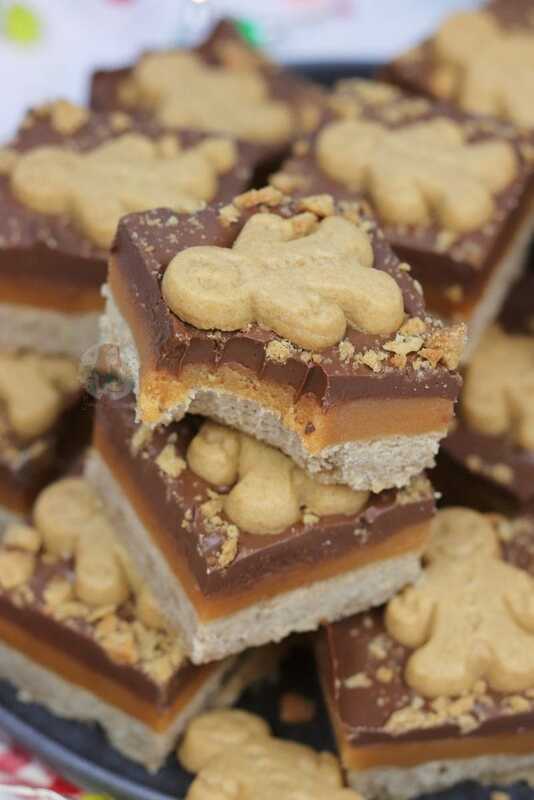 The Caramel is homemade, and a personal favourite recipe of mine. Yes, you MUST MAKE YOUR OWN CARAMEL, using a caramel from a tin will NOT work, because yuck. It will honestly be such a sticky mess, and the taste of the caramel is completely different. The tinned caramel works for recipes where you need sauce, such as my Caramel Rolo Cheesecake, but not for recipes where you need it to set on its own. Like this. Trust in the recipe, it’s important. Some people struggle, and it’s down to the heat level. It’s near impossible to describe the exact temperature to have the hob on, as all cookers are different. Even induction and electric hobs are different, and I use Gas because I much prefer it. If you find it burns, or doesn’t set, or anything like that… the timing or temperature were incorrect. Even using a different pan can make a difference! Give it another go though, you’ll find your caramel rythm! I decided to not put any Gingerbread themed goodies into the caramel, as I didn’t want to mess with it, but the chocolate on top? That was open for goodness. I did think about adding in more spices to the chocolate, but as I wanted the chocolate to stay quite sweet, I thought I would just add in some Ground Ginger. I literally just melted the chocolate and then stirred the spices in. That simple! 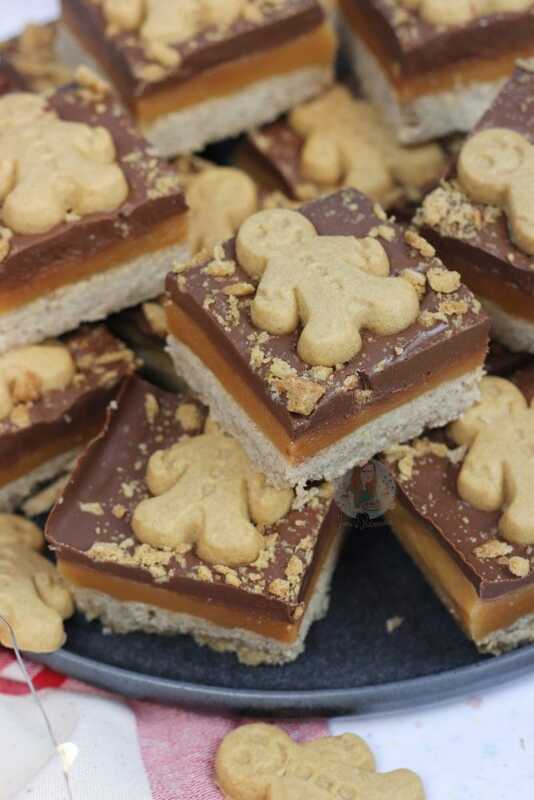 Yes the gingerbread men I am using in this are shop bought… oh wait, it doesn’t matter. 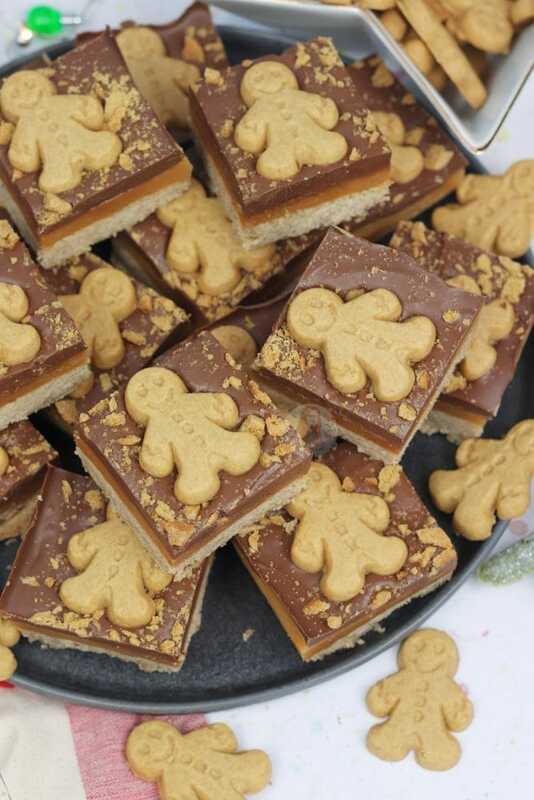 To be honest, I had such a long list of things to bake one week, I just didn’t want to add Gingerbread Men into the mix so I bought some mini ones and I think they look cute! It also means you don’t have to wait on another thing for this traybake, which is always good when the setting times are a while. Cream together the Sugar and Butter in a stand mixer with the paddle attachment until smooth – mix in the Flour, Ginger, Cinnamon, Nutmeg and allspice until a dough is formed. It will be crumbly but the ingredients will be evenly dispersed! Firmly press the mixture into the bottom of the tin and bake in the oven for 20-25 minutes until pale golden on top! Once baked, remove from the oven and leave to the side. 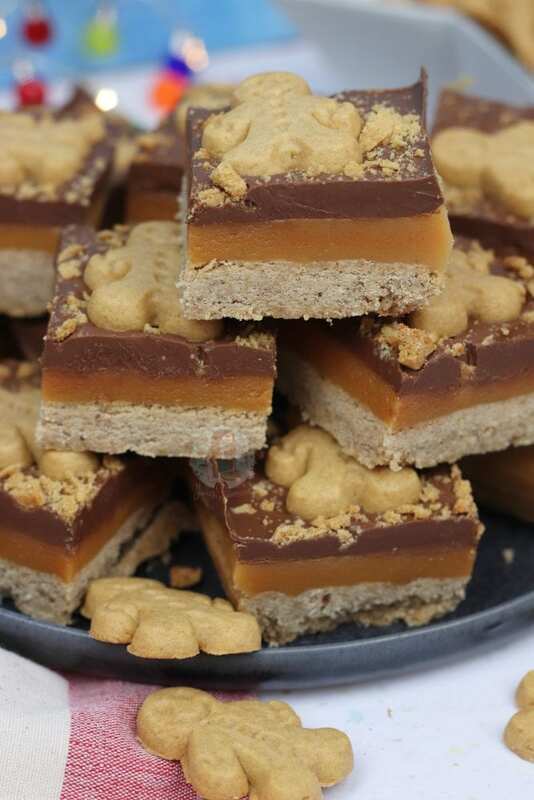 Pour the caramel onto the shortbread base and leave to set for an hour in the fridge. Once set, melt the Chocolate, stir in the Ginger, and pour over the caramel. 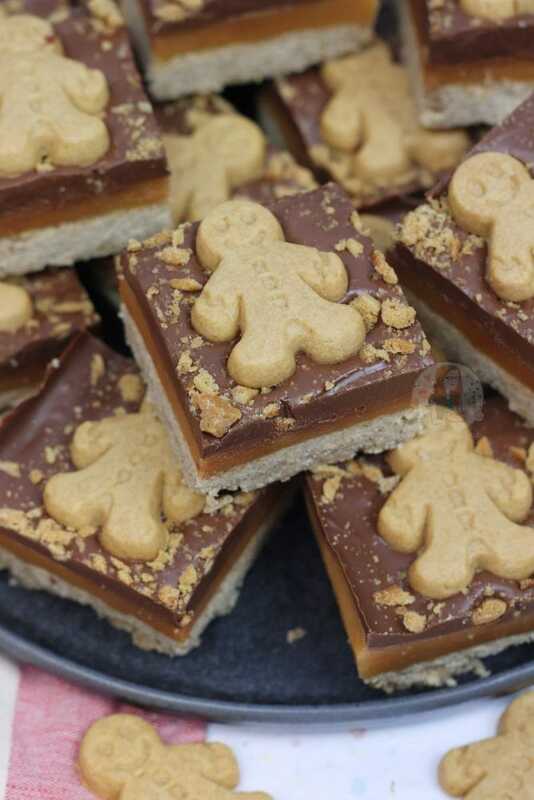 Put some crushed and whole Gingerbread Men on top of the Chocolate, along with some of your favourite sprinkles, and leave to set in the fridge until solid. About 1-2 hours! 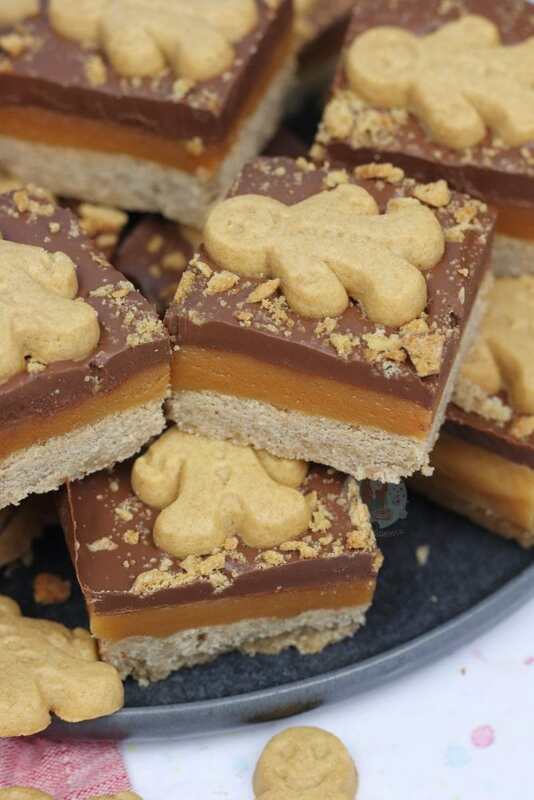 Cut your shortbread up, and enjoy! You can use other flavour chocolate on the top if you wish! Older Next post: Baked Gingerbread Cheesecake! Newer Previous post: Salted Caramel Pretzel Cupcakes! if I wanted to measure the golden syrup how much would you recommend?